Made from durable rubber and PVC coated for resistance to detergents, oils and greases, the Shield GI/R603 PVC-Coated Rubber Industrial Gloves offer premium hand protection for high-risk and heavy-duty applications. An ergonomic, hand-specific design promotes dexterity, while a cotton flock lining reduces perspiration to enhance user comfortable. 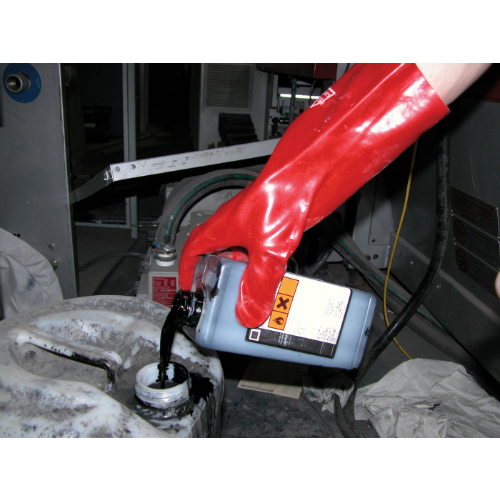 A PVC coating on the exterior of the GI/R603 Gloves provides protection against detergents, oils and greases. A long cuff that extends up the forearm further enhances safety by protecting the lower arm from contact with harmful substances and liquid splashback. The GI/R603 Gloves are cotton flock lined for increased comfort and reduced perspiration. Their hand-specific shape and smooth finish provides a comfortable fit, reducing hand fatigue during long periods of wear. Bright red in colour, the GI/R603 Industrial Gloves are ideal for environments where colour-coding is used to reduce the risk of contamination. This includes hospitals, clinics, laboratories, care homes, factories and kitchens. 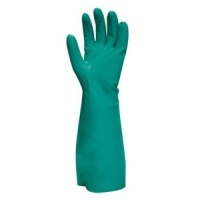 The GI/R603 Rubber Gloves are available in size 9.5 only. They have a minimum length of 300mm and a palm width of 110mm. 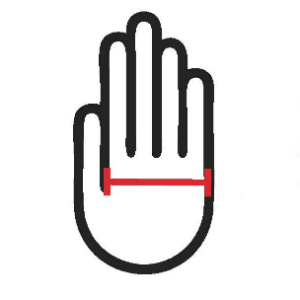 To determine whether this is the right size for you, measure your hand across the widest part of your palm, as shown below.